a) So tonight… right here… in this very ring… we will have… The Boston Red Sox vs. the Tampax Bay DRays… INSIDE A STEEL CAGE!!! No count outs… No disqualifications… NO MERCY!!! b) Major League Baseball’s rules for on-field conduct are quite clear. It’s the off field rules that are sort of vague. So if they want to engage in misconduct, they should do it in a bathroom with a needle like misters McGuire and Canseco. c) Major League Baseball has a long standing policy of encouraging clubs to settle their differences off the field, for instance, at a local tavern or in a dark alley. 1. In light of his recent quarrel with the Boston Globe’s now former Ombudsman, it has become clear to Jose that if KEYS is going to be taken seriously, there needs to be someone affiliated with the blog whose job is to represent the people, the readers of this fine feature. Thus, KEYS has made the decision to create a permanent KEYS TO THE GAME Ombudsman’s Office. The job of the ombudsman will be to represent the readers. Readers are encouraged to post comments or send questions to keystothegame@hotmail.com and the ombudsman will be certain that they get to Jose himself. This should be quite easy, as the ombudsman will be Jose himself. (Note: What did you think Jose was going to hire staff?) But as an added feature, the ombudsman will periodically, present and address the reader perspective. Well, Steve-O, for the answer to that question you’ll have to wait for the release of Jose’s autobiography “Perfect Jose’s Not” which will detail his hard nights of drinking before day games, his struggles with his weight, and of course David Wells’ copyright infringement lawsuit against him. Still, you raise a serious question. How is it exactly that a man like Jose, a man with several years of education at the nation’s finest university that has more that 25,000 students and no football team, can make so many typos and confuse so many homonyms? This is sort of like asking how George Steinbrenner, a man with several world championships and millions of dollars could decide that it was a good idea to sign Jaret Wright. And the answer is the same… extreme stupidity. For the full KEYS visit www.wallballsingle.com. 1. Remarkably, Jose’s reaction to the call up of Lenny DiNardo is exactly the same as the one Marge Simpson had when Homer informed her that his friend Lenny was being taken to the hospital following the explosion of a cooling tank. “Oh no. not Lenny. Not Lenny!! !” Unfortunately, while Marge was reacting a lie Homer told to cover up his evening of bowling, Jose is almost certain that Lenny DiNardo has really been called up (note: after all, he did pitch last night) and it is not just an elaborate ruse cooked up by Theo so he can ditch the ballgame and go knock down some pins. Oops… Now Jose’s done it. Things were going just fine around here. Jose was getting about 1,000 hits a day, he was having a good time writing, you were having a good time reading, skimming or ignoring; everything was great for everyone. But Jose couldn’t leave well enough alone. Much like George Steinbrenner, he had to tinker, to jostle his product for no reason other than a need to feel like he was doing something. So Jose went and tried to pick a fight with the Boston Globe, which as best Jose understands is a newsletter of some kind. And now Jose has cost someone her job. Not cool. All Jose has ever wanted to do is make people laugh, kill time, and become the first “Jose Melendez” listed when one googles the name (note: he is), but somewhere along the line he went mad with influence (note: not power… power launches battleships, Jose can’t do that… yet). Much like President Bush’s economic policies and the 2001 Red Sox, Jose started costing people their jobs. And it doesn’t feel good. Many of you probably saw the final column of Globe Ombudsman Christine Chinlund yesterday. Officially Chinlund said that she resigned because the ombudsman’s chair, much like the Red Sox manger’s chair, comes with a three year maximum stay. It was nice of the Globe to give her a dignified exit like that, but, sadly, Jose knows better. With only three to six enormous leaps of faith and logic one can easily discover that she was, in fact, driven out by enormous pressure from Jose’s People. How did it all come to this? After the Globe Ombudsman’s office told Jose that they do not review self-published books, Jose did his best impression of Curt Euro and moped and raged and wrote late into the night until the solution became clear – let’s get a whole bunch of people to send emails to the Globe. In addition to being a former relief pitcher and blogger, Jose is a professional organizer, so the idea of organizing a mailing campaign was completely natural to him. After all, in politics there is a saying “One letter is a crackpot, five is a movement, 10 is a crisis.” Jose figured the same probably holds true for periodicals. Apparently, many of you fine people heeded Jose’s call and sent emails demanding that the Globe explain its sensible and well-conceived discrimination against the crackpots who self-published books. Jose knows for a fact that at least nine of you became part of Jose’s coalition of the willing and if you add those nine emails to Jose’s one, we have ten… crisis city. Faced with enormous pressure, the Globe sent out a response. that arrive, so we are quite limited in our space. All we can promise is that we'll examine each book carefully. Do you hear that? Do you hear that off in the distance? Summertime must be coming, because that sounds like flip flops. Just one week ago the Globe told Jose “Sorry, the Globe does not review self published books.” And now? Now they have “no formal policy against self-published books.” Not only has the Globe flip flopped on whether or not they will review self-published books, but also on the issue of whether “self-published” is hyphenated or not. In both cases the good guys won. Which brings us back to Ms. Chinlund. Ms. Chinlund was forced out because she forgot that the job of the ombudsman is to represent the people and Jose’s readers are the people. Well, they are people anyway, if not “the people.” Jose is pretty sure none of his readers are chimps, really smart dogs, dolphins or aliens. So the Ombudsman’s office has learned a lesson: To paraphrase Margaret Mead, never doubt that thoughtless, poorly organized, nominally committed group of citizens can change the world in some small, meaningless way. (Note: maybe next Jose should organize a letter writing campaign to umpire Greg Gibson demanding that he stop being such a jerk). It’s an important lesson. But Jose has learned a lesson too. If one wants his book reviewed, it helps to send it to the reviewer. Go figure. 1. A few weeks ago, Jose vowed to develop a change up, in order to counter the fact that his punch lines had gotten as predictable as a Tom Gordon fastball in October. 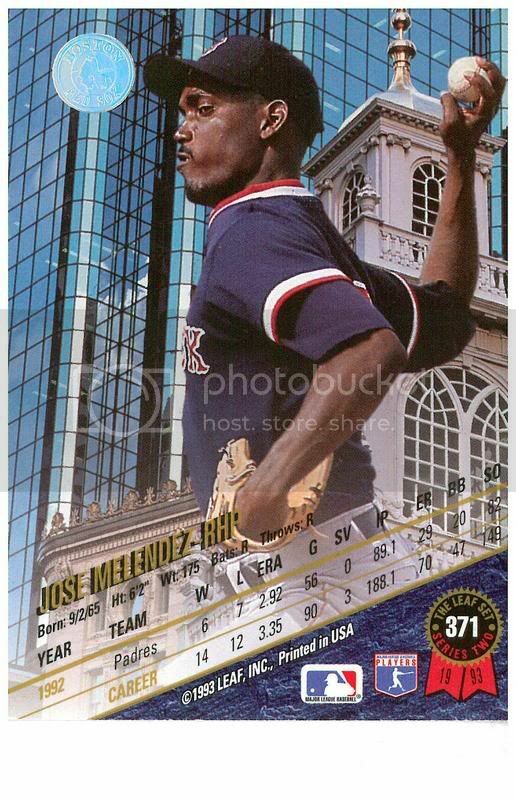 People, specifically the Melendezette, were starting to time his pitches. Jose’s initial thought was that knock knock jokes might be a way to mix it up, but it turns out that knock knock jokes aren’t funny... ever. Jose telling a knock knock joke is a little like a lefty throwing a curve ball to Manny; it might sound like a good idea, but if one thinks about it for more than 30 seconds, it becomes clear that it’s a really bad idea. Then, if one goes through with it anyway, the results are typically disastrous. Jose: Derek Jeter is a good offensive short stop, but he is a defensive liability who is badly overrated by the New York and National press. See. While that is true, that is not funny. The only thing even vaguely funny is using the term “straight man” in a joke about Derek Jeter. So Jose figured he’d need to try something else for his backup pitch, perhaps some riddles. Q: Why did David Ortiz cross the road? A: Because Dale Sveum gave him the green light even though there were no outs, the fly ball was way to shallow and a car was completely ignoring a stop sign and rushing forward at 75 mph. Q: Why did Jason Giambi throw a clock out the window? A: He wanted to see time... Oh... No, wait. Roid rage. The answer is roid rage. Q: How many Yankees does it takes to screw in a light bulb. A: None. If Steinbrenner owns the light bulbs they’re already screwed. Q: How many Red Sox does it take to screw in a light bulb. A: Who needs light bulbs, the Red Sox are already well lit by the gentle glow of victory. So after that failed Jose really sat down and thought about what is making people laugh these days, and then it hit him– observational humor. Okay, so it was more making people laugh inn 1997ish than now, but it’s all Jose got... that or gross out humor. So let’s give observational humor a try. What’s the deal with the .406 Club? It’s not really a club. You don’t have to apply for membership. It doesn’t have passwords or secret handshakes. Heck, you don’t even have to have hit .406 to get in. On the other hand, it is better than when they called it the 600 Club. The 600 Club sounded like it was a club for people who are pretty self righteous, but not quite self righteous enough to make it to the 700 Club. How was that? Not great was it? Well, it’s back to throwing fastballs for Jose. More badly out of date Cesar Crespo jokes and nicknames no one quite gets coming up!